4 riders at Peckham Square for the 10am start, plus Bruce leading. Small number maybe due to poor weather forecast. In fact the rain held off and the sun came out – so nice cycling weather. Up to Telegraph Hill with great views across central London, then down to Deptford Creek and Greenwich. 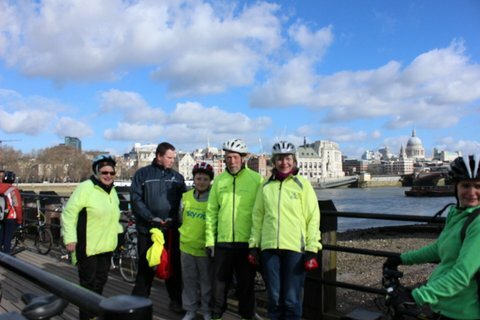 Meet up with Philippa at Greenwich, so 6 riders on the return leg. Back through Deptford, Bridge House Meadows and Brimmington Park. In such good time, added a loop via Burgess Park. Route at - http://goo.gl/maps/GkEuB. 14 riders at Canada Water. Bruce leading on a loop to Burgess Park and back. Had time to check out the BMX track, busy with youngsters practising. Back along the Connect 2 route, including checking out the new cycle/foot bridge. Then to Greenland Dock and a quick stop at the Barry Mason memorial bench. Still in good time, so completed the Connect 2 route to the river before returning to Canada Water via Russia Woodland. Patricia’s app said 10.1 miles and 575 calories burned. Route at http://goo.gl/maps/W5ArW. 16 riders at Peckham Square at 10am, Bruce leading with help from David and others. Canal path and Burgess Park, then Wyndham Rd, Myatts Fields, Slade Gardens, Ferndale Road and eventually Brixton Windmill. 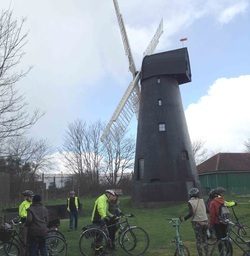 A brief hail shower greeted us at the Windmill, but did not last long and most of the return ride was in sunshine. 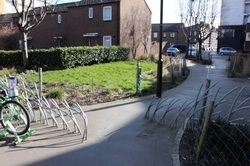 Return route cut through to Brockwell Park via the Tulse Hill estate. Then through the tunnel at Herne Hill Station and along to Ruskin Park, on past Denmark Hill station to Lyndhurst Way and back to Peckham Square via Kelly Ave for 11.55. Laura’a computer logged 9.9 miles and calculated 435 calories burned. Route at http://goo.gl/maps/ETBfk . Great forecast brought out 17 riders for the Canada Water start. This is the largest number since I took over co-ordinating these rides. A fascinating ride ending in warm spring sunshine. 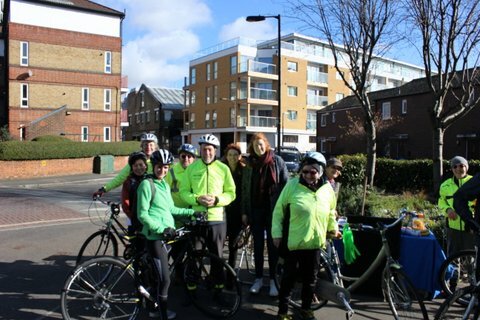 12 riders, plus Bruce leading, set off from Peckham Square in bright sunshine. Down to Rothsay St/Law St junction via Burgess Park, Surrey Square, Willow Walk and Webb St. There found the Sustrans “pop-up” table (with cakes) with 2 Sustrans people already taking to one of the locals about the plan to use Rothsay St as part of the Central Grid/Quietway. Might have to modify the artistic barrier (see photo) and maybe reduce the size of the recently installed flower bed. But could be a good replacement for present LCN22 route across the busy Grange St/Tower Bridge Rd Junction. 13 riders gathered at Canada Square at 10 o’clock in bright sunshine with much chatter about our luck in finding a break in the weather. 4 new riders, 3 of whom had seen information on the British Cycling Skyride site. David led off down to the river for a run eastwards to Greenwich. Unannounced, a large black cloud appeared and dumped its wet contents on us. Undaunted we headed on. 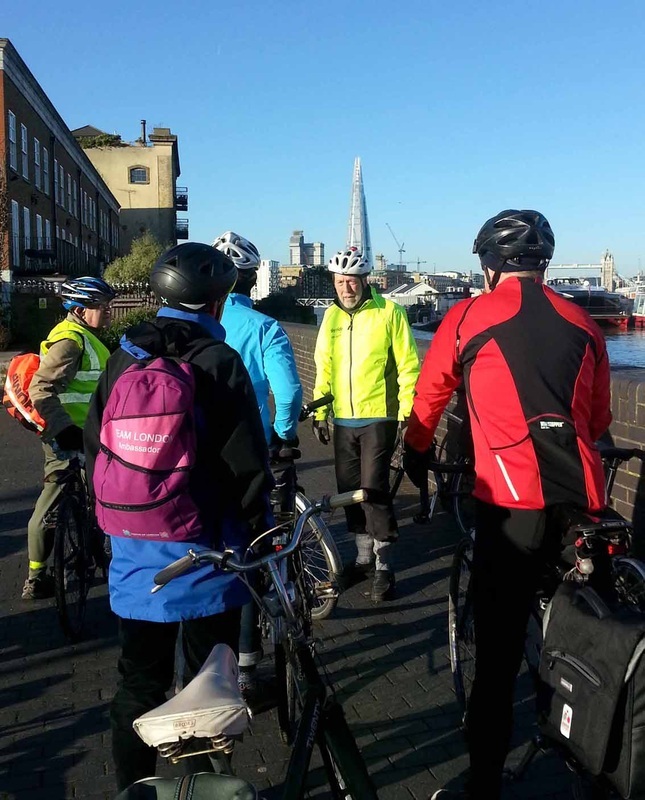 Stopped at Deptford Creek where David assured us that work on the much delayed pedestrian/cycling bridge was supposed to start next week (see Greenwich Cyclists Yahoo Group, https://groups.yahoo.com/neo/groups/greenwichcyclists/conversations/topics/11166). Looking forward to that opening by the end of the year. With route along the next stretch of river front also opening, the detour out into busy Creek Road becomes unnecessary. On to Royal Naval College and, guided by one of the riders, a short detour to Park Vista (just across Trafalgar Rd) where the prime meridian is marked on the road (see photo below). Back by the same route to Canada Water where the sun was out again! Eleven riders at Peckham Square for 10am start. Cloudy but dry. David remarked on my ability to find breaks in the weather for Healthy Ride Saturdays! Headed up Rye Lane and along Holly Grove, site for one of the planned “Peckham Pockets”, the Sustrans-led programme to create quiet pockets of calm close to Rye Lane (see http://pocketplacespeckham.wordpress.com). Actually, Holly Grove is not bad as it is! At this point David punctured. He decided that as we were right next to Peckham Rye Station he would just get the train home. So down to 10 riders and lost my reliable tail man. Followed the proposed Quietway up Bellenden Rd, then through to Goose Green and up Crystal Palace Road and on to Dulwich Park. 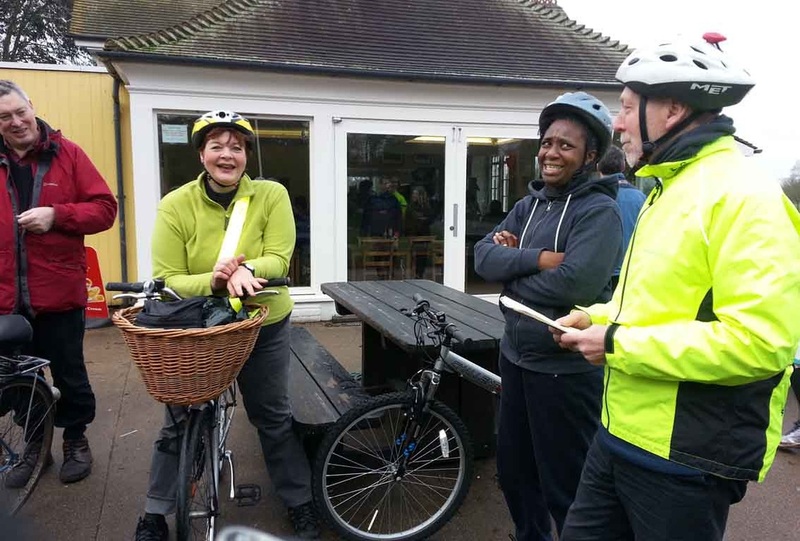 Short stop at the Café then on south and through to College Rd and Paxton Green Roundabout (still on the new Quietway route). Up Dulwich Wood Park to Kingswood Drive. There the group split with 4 riders doing the ascent to the Col de Crystal Palace and descending Fountain Drive to meet the rest of us at the east end of Kingswood Drive. Then a glorious downhill along College road and back to Dulwich Park. 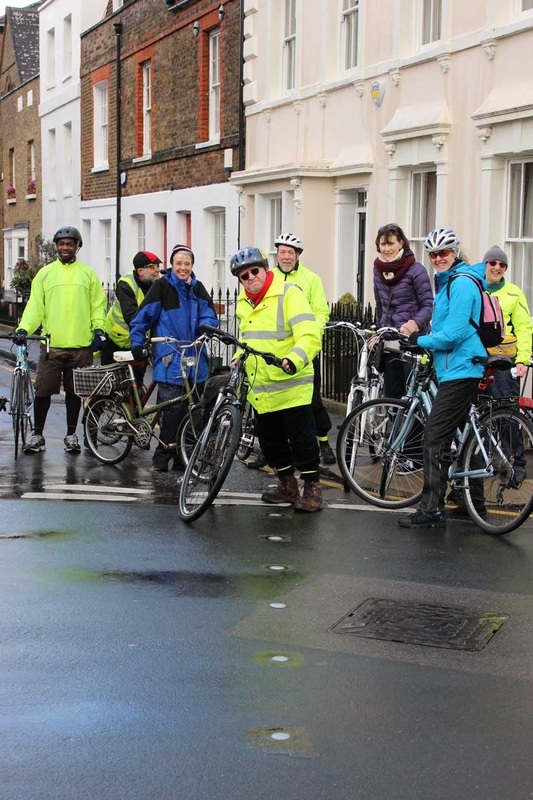 On to Friern Rd (another lovely downhill to make up for all the uphill on the outward leg), across Peckham Rye Park, and on to Nunhead station on LCN 25. At Nunhead tried the proposed Quietway route down Hollydale rather than the existing LCN route down Kimberley Ave. Then across to Rye Lane via Bournemouth Close (another Peckham Pocket). Finally back to Peckham Square past the friendly demo against Bedroom Tax, which we negotiated eventually, gathering some literature at the same time. Patricia’s app claimed we had burned 550calories. Lets have some cake, said Jane! 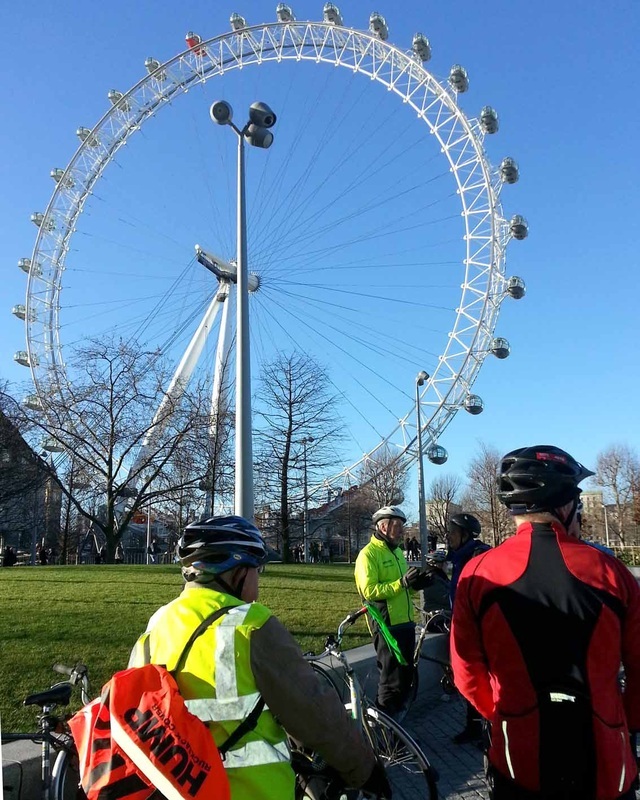 10 riders, including 3 new ones, at start at Canada Water on beautiful sunny morning. Plan to use Overground scuppered by engineering work (no room for bikes on the rail alternative buses!). Decided to ride West along the river and enjoy the views on such a crisp clear day. Stopped at Hopton St to look at proposed route through railway arches planned as part of redevelopment of Sampson house site (see item here). This will eliminate the diversion to Southwark St. Still no route through Upper Ground from Blackfriars Bridge, but traffic light, so no problem. NB Upper Ground should re-open here in March. Stop at Jubilee Garden then return via Union St.